A great way to use more wild greens in our daily meals is to use them as wraps of sticky dishes, so any recipe of risotto, sushi rice, dolmades could work for that... in fact, any grain that sticks will work out for this. Add your favourite seasonings and available fresh herbs and you'll have a delicious creation with your wild harvest. For this version I could simply have cooked the quinoa a bit longer to make it sticky. Instead, I used 2/3 quinoa and 1/3 amaranth, so it got naturally very sticky, making it easy to keep the rolls in shape. Mix the pistachios, fresh dill and apricots with the rice / quinoa. Season with nutmeg, sucanat, balsamic vinegar and ras-el-hanout. Wrap the mixture into the leaves. Best to prepare the little rolls in advance, then the leaves will stick better together when serving. 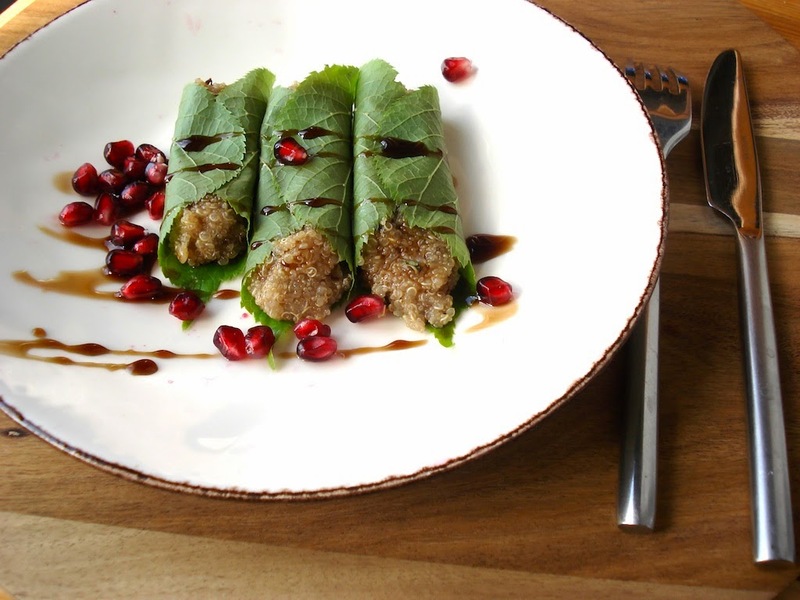 Serve with tahini-mint dressing and / or pomegranate syrup. For an extra aromatic effect, cook the rice or quinoa with a laurel leaf and / or kaffir lime leaves. If you can not find dill, try serving it with a dill-mustard sauce when serving. Or use other fresh herb of your preference.